The Ornament of the Mahayana Sutras (Skt. 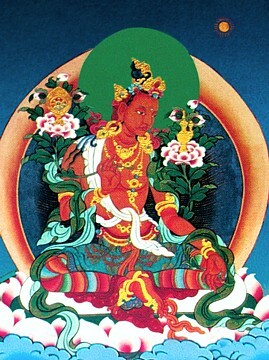 Mahāyānasūtrālaṅkāra; Tib. ཐེག་པ་ཆེན་པོའི་མདོ་སྡེའི་རྒྱན་, Tekpa Chenpö Do Dé Gyen; Wyl. theg pa chen po'i mdo sde’i rgyan; Trad. Chin. 大乘莊嚴經論) — one of the Five Treatises of Maitreya. It is included among the so-called "Thirteen great texts", which form the core of the curriculum in most shedras and on which Khenpo Shenga provided commentaries. And brings all beings to maturity at the three levels. The embodiment of love, and indefatigable. This page was last edited on 18 January 2019, at 21:02.